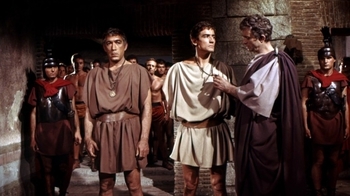 Barabbas is a Film programme that first aired in 1962 and has been classified a PG certificate. Epic biblical tale about the criminal who was released by Pontius Pilate in preference to Jesus, prior to the Crucifixion. The action follows Barabbas after his lucky escape, his return to crime and his subsequent recapture and imprisonment in the sulphur mines. Based on the novel by Swedish writer Par Lagerkvist.